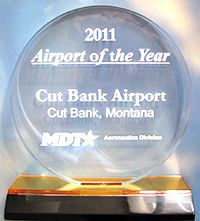 Cut Bank International Airport (MDT Aeronautics Division Airport of the Year 2011) is located three miles southwest of Cut Bank, Montana in Glacier County. With Glacier National Park, Flathead National Forest, Lewis and Clark National Forest and the inspirational Bob Mar-shall Wilderness within an hour drive, the Cut Bank area offers some of the best outdoor recreation opportunities in some of the most pristine and picturesque surroundings anywhere in the world. If you are flying to any of these areas, Cut Bank International Airport is here to fill your every need. Enthusiasts have a choice of horseback riding, world class fishing, white water rafting, big game hunting, hiking, mountain biking, snowmobiling, cross country skiing and much more. Over half of Glacier County is part of the Blackfeet Indian Reservation which makes the area culturally diverse and rich in history. And don’t forget about Montana Fun Weekend at the Cut Bank International Airport grounds that hosts a variety of events that include an air show, car show, museum, and other festivities that are fun for the whole family and attended by the area’s communities. The 1,730 acre airport’s two runways are Runway 5/23 and 14/32. Runway 5/23 measures 5,300 feet long by 75 feet wide, and Runway 14/32 measures 5,300 feet long by 75 feet wide. All runways are rated at 28,000 SW, 40,000 DW and 60,000 DTW. Taxiways are rated the same and the ramp is concrete. Fuel services are available 24/7 with 100LL and Jet A fuels (with priss) ready at competitive pricing. All conventional credit cards are welcome plus government cards are also accepted. Fuel is self-service or full-service. All airport services are available on a full-time/callout basis. Other services offered are free courtesy vehicles, outdoor camping spaces available (no hookups), pilot lounge, wireless internet access and two sleeping rooms. U.S. Customs service for aircraft returning into the United States is available on a two-hour call-out notice. Aircraft entering Canada are required to check with Canadian Customs Services for arrangements. Ramp tie-downs and hangar space is usually available. The administration building was constructed in 1948 and is part of the National Historic Registry District. It’s worth taking time for a visit to see this beautiful post-war building which is much the same as it was over 50 years ago when it served as a hub for Western Airline’s DC-3 and DC-4passenger aircraft. The Cut Bank International Airport is jointly owned and operated by the City of Cut Bank and Glacier County. There are five members appointed to form an Airport Authority to administer the airport. The city and county each appoint two members to represent them and then the fifth member is appointed jointly. The board meets regularly at 6 pm on the third Tuesday of each month at the airport administration building. Guests are always welcome. The Cut Bank International Airport is jointly owned by the City of Cut Bank and Glacier County. The board consists of two representatives from the city, two from the county and one joint city-county representative. The Cut Bank Airport Authority operates independently from either entity, but receives funding in the form of mill levies from both the city and county. Even before World War II, the expansive flat area where the airport is currently located was drawing attention from local “brave souls” who had the nerve to fly early aircraft. 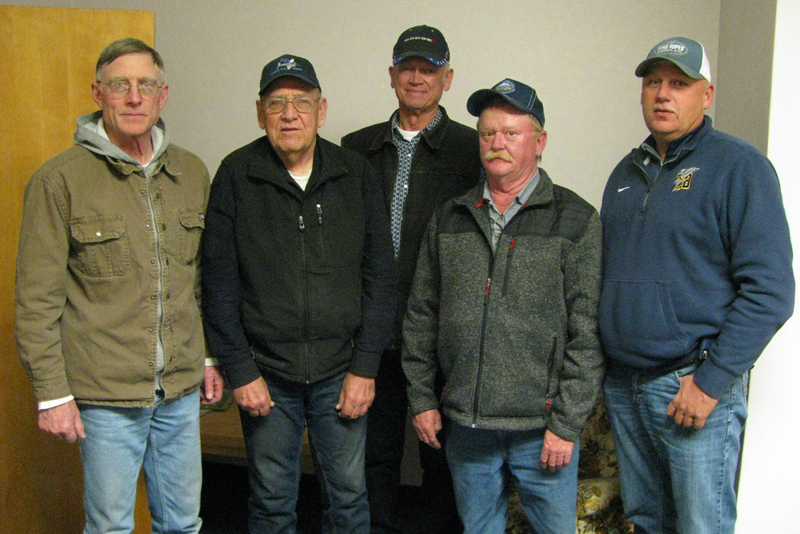 After World War I ended in 1918, the appetite for a local airstrip grew as pilots who served overseas in the war returned home to the “highline” area. When oil was discovered in the Kevin Field north of Cut Bank, the nearby communities of Cut Bank, Shelby, Kevin and Sunburst began to thrive. According to local newspaper coverage, thousands of people attended the ceremonies with representatives from surrounding towns, which had supported the airport, arriving in a fleet of automobiles. The Shelby Marching Band even provided musical entertainment for the crowd. Cut Bank already had several pilots when civil aviation began to appear in Montana in the 1920’s. Several of them had gained first hand experience during WW I. With the discovery of oil in the area, industry was booming and local dentist Dr. C.H. Minette recognized the need for a facility to serve private and commercial aviation. In 1930 this site was selected and the land was leased as a private airfield. Soon afterwards the property was purchased from Blackfeet Tribal landowners by the City of Cut Bank and Glacier County and Western Airlines made its inaugural flight to the new field in 1941, landing the venerable Douglas DC-3 on a grass strip. Soon, after the Declaration of War in December of 1941, the airfield was offered to the United States as a training base. Cut Bank joined Glasgow and Lewistown all of which were satellite bases of the Great Falls Army Air Base or East Field. Construction began early in 1942 and troops began training here in November of the same year. Two runways accommodated the B-17 Flying Fortresses on which the young men trained as a crew for the first time. Squadrons learned navigation, bombing techniques and other aspects of a B-17 crew before joining the forces on the European Front. The base had a relatively short lifetime: construction authorized by the 2nd Air Force on July 6th, 1942; base activated November 11th, 1942; first B-17’s arrived November 30th, 1942. The last crew to train here was the 401st Bomb Group (H), 613th Bomb Squadron. With their departure in October of 1943, the base was soon placed on inactive status for the remainder of the war. In 1948, much of the base property and buildings were transferred to Cut Bank and Glacier County. Many of the base buildings and remaining equipment were salvaged as surplus and by the mid 1950’s only a small percentage of the structures still existed. Throughout the war, Western Airlines continued domestic service to the area using a separate building just north of the main base. Western Airlines dis-continued commercial flights to the air-port in the late 1960’s. In 2007 the Cut Bank Municipal (International) Airport and Army Air Base was listed on the National Register of Historic Places. The entire 1,750 acres and all the structures located in that area has been listed as a “Historic District” which includes everything from runways and buildings to the sewage disposal system installed when the base was built and is still in use today. In this sense, the entire area is our “museum” and we are very fortunate to have several major structures that have survived the last 65 years. Unfortunately, many of the buildings, the water tower and the original control tower were destroyed decades ago. Of course, the jewel of the remaining buildings is the 120’ x 160’ main hangar. Built during the Fall and Winter of 1942-43, the concrete and wood building still stands proud and extensive renovation was completed in 2009. The 20,000 square foot room echoes history with signatures of some of the builders still on the wall near the center cat-walk, up 65 feet from the concrete floor. One of the south window frames still boasts a bullet hole from a stray .50 cal machine gun. Several other original buildings are currently undergoing restoration or repair efforts. The WWII Airmen’s Memorial Museum is a 501(c) (3) not for profit organization. The small collection includes many communications-related items, mostly relating to the base and the B-17 aircraft that were stationed there. We have accumulated an extensive informational history of the base and the crews that served in the European Theatre of operations from 1942 to 1945. You can also see the once top-secret Norden Bombsight used on the B-17’s, practice bombs used to train the crews and other interesting memorabilia. Personal walking tours of the grounds are available and groups are always welcome with advance notice encouraged. For additional information on the museum and the airport, or to arrange a tour, please call 406-873-8683.